At the Fourth Aurora Asian Film Festival, a series of Manick Sorcar's award-winning animation classics were featured on June 2, 2001, at 11 am, which solely represented India with immense pride. Manick Sorcar was a featured guest for the Festival's first Children's Matinee. 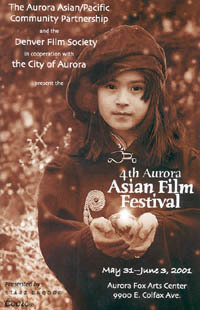 The festival which ran from May 31 through June 3, 2001, was jointly presented by the Aurora Asian/Pacific Community Partnership, Denver Film Society, and the City of Aurora. It was held at the historic Aurora Fox Arts Center, 9900 E. Colfax Ave, Aurora, Colorado, USA. On the Opening Night, Manick Sorcar was interviewed live by the KACT-TV, Channel 8, where he was interviewed by Brit Withey, the Program Director of the Denver Film Society and Nancy Phillips, the News Producer of the City of Aurora. He was introduced as "the internationally acclaimed animation film director from our own Colorado". On June 2, 11 am, prior to his animation films, Manick Sorcar was introduced as the "Director in Person" by Ms. Gloria Williams, Co-Chair of the Aurora Asian/Pacific Community Partnership. It was sponsored by the Young Music Ambassadors, Polynesia-Pacifica Foundation of Colorado, Aurora Cultural Arts Action Team. The proceeds from this show were donated to the benefit of earthquake victims of India. The "Animated Works by Manick Sorcar" (a total of 1-1/2 hours) featured Deepa & Rupa: A Fairy Tale From India (Gold Plaque, Chicago International Film Festival), The Sage and the Mouse (Gold Medal, International Film Festival of New York), and The Woodcutter's Daughter (A Finalist in Children's Program, at the New York Festivals), all of which are based on classic fairy tales of his native India. Other films that were included at the festival representing various Asian countries were Himalaya (Nepal), Breaking the Silence (China), Anak (Philippines), Nang Nak (Thailand), Gaea Girls (Japan), Chac (Vietnam), From Opium to Chrysanthemums (Thailand/Laos), Il Mare (Korea), Departure (Japan), Hidden Whisper (Taiwan), and 12 Nights (Hong Kong). The four-day film festival was enhanced by live cultural programs from various parts of Asia. On the Opening Night, the Chinese Lion Dance, with the spectacular Shaolin Hung Mei Pai, a 20-member ensemble with three lions and percussion, lead the audience to the Aurora Fox Arts Center. Before the screening of Gaea Girls and Chac, a children's entertainment featuring the Young Music Ambassadors and Polynesian music and dance by the Jr. Wahines were performed on the Fletcher Plaza. Prior to the screening of "Animated Works of Manick Sorcar" a 10 minute "Indian Lamp Dance" was performed by a the Sorcar Dance Troupe, under the direction of the Sorcar Sisters Piya and Payal.